The crew of the inaugural mobile dental unit run at the clinic’s ribbon cutting: Left to right — “Trailblazers” Machelle F. Thompson, RDH, MSPH; Alexis Bryant (D-3), Nicolet Smith (D-3), Jasmine Copeland (D-4), Erica Robinson (D-3), April Savoy (D-3) and Walter R. Owens, D.D.S., FACD, FICD. “We provide the dental services that they have to have” to meet government requirements, said associate dean, Walter R. Owens, D.D.S., FACD, FICD who led the team along with Machelle F. Thompson, RDH, MSPH, assistant dean, clinical affairs and director of compliance, and associate professor, dental public health. Dr. Owens said the team provided dental services, screenings, exams, prophies, and X-ray imaging along with an evaluation about future patient needs. 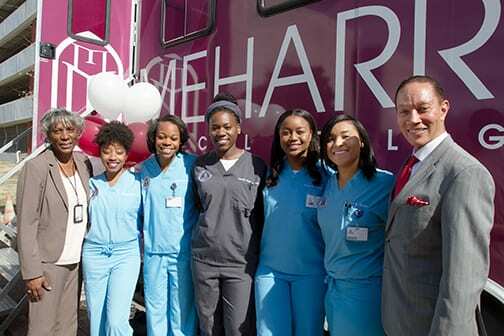 The Meharry School of Dentistry students—Alexis Bryant, Erica Robinson, April Savoy and Nicolet Smith (all third-year, or D-3 students) and Jasmine Copeland (a fourth-year, or D-4 student) lightly referred to themselves as the “Trailblazers,”—the moniker seemed appropriate for the clinic’s first time out. Over two days, the “Trailblazers” performed 65 procedures. “We knew we were going to see patients in that facility,” Ms. Thompson said. “They have approximately 300 residents between the four sites they have.” But, she said, they didn’t really know what to expect. To the student dentist team, not only was the adventure about service, it was about learning. “The very last case, we had a [13-year-old] male come in,” said student dentist Copeland. “It was dark and everyone was tired—I’m sure he was tired—and he came in and sat in our chair and I did an exam and I did his medical history and, you know, worked him up.” When Dr. Owens came over to confirm the exam findings, she said, the student got aggressive—he would only let the student work with him. Eventually, with the collaboration of a counselor and others, they were finally able to treat him. “It took quite a while,” she said. Ms. Thompson said the counselors from that first trip are asking when the clinic—and the students—are coming back. “They really left a mark,” she said.